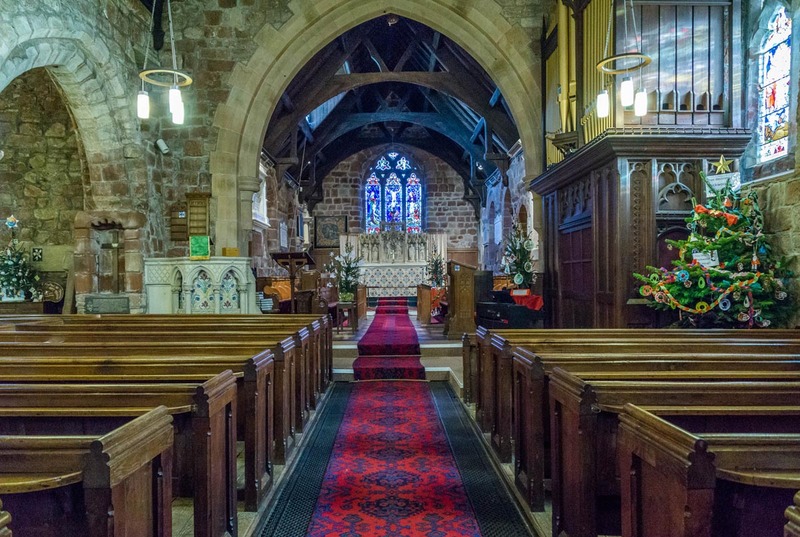 The cross is near the front of the church on the left hand side as you face the altar. 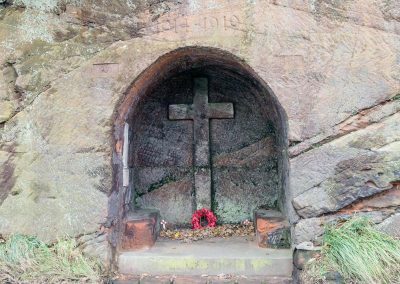 The cross is mounted inside a small brick alcove. 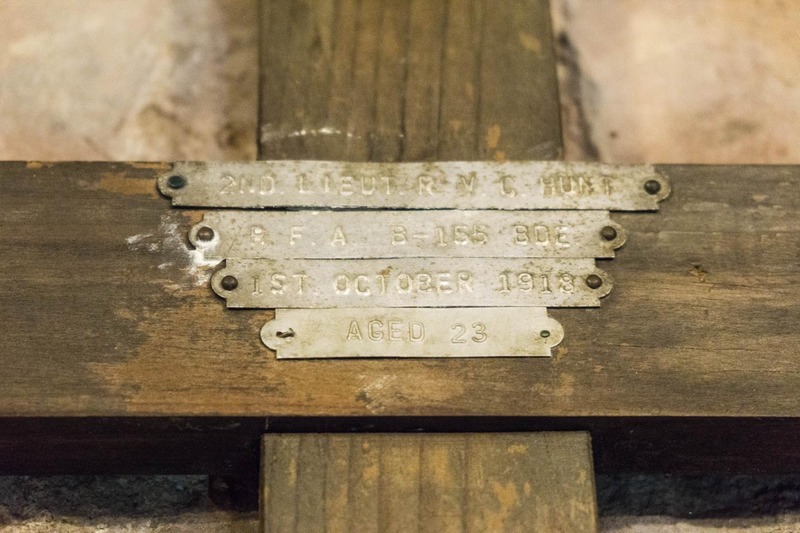 The cross commemorates 2nd Lieutenant Roger Victor Cecil Hunt. Text type (e.g. hand-written, GRU tags, carved): 4 GRU tags. The GRU tag is missing, and it also looks like there was another tag underneath the cross member. 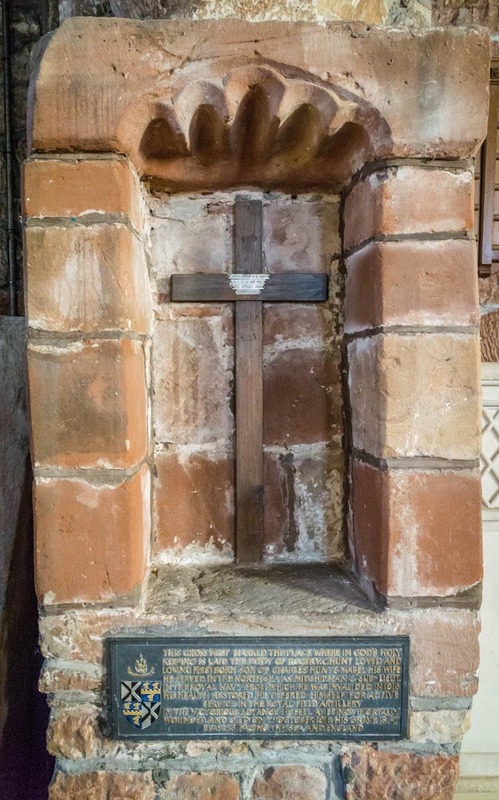 Mounting to wall: The cross has been attached to the brick alcove by a metal bracket. 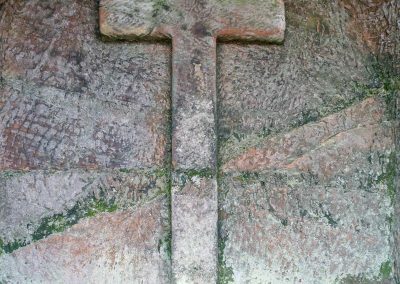 Evidence of use in field (earth marking, cracking, staining, shrinkage): There is discolouring towards the bottom of the cross. Surface insertion depth (into ground if apparent): 203.2mm. Finish (varnish, paint, oiled, unfinished etc): Dark stained wood. 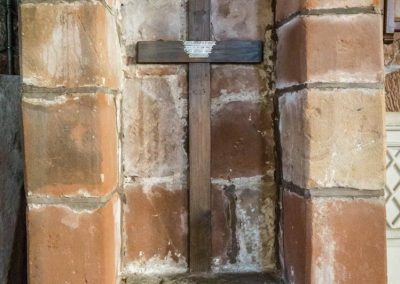 Condition (cracked, paint peeling, woodwork, damage etc): The cross is in good condition overall. 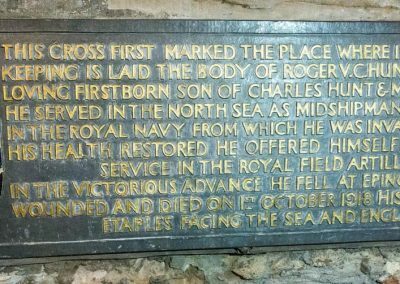 Underneath the cross there is a stone plaque which reads ‘This cross first marked the place where in Gods holy keeping is laid the body of Roger V.C.Hunt loved and loving firstborn son of Charles Hunt & Mabel, his wife. 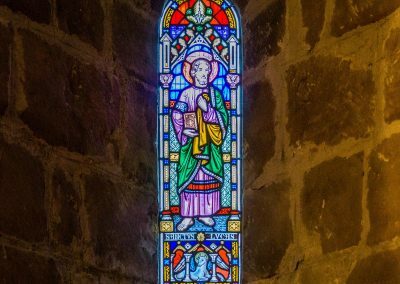 He served in the north sea as a midshipman and Sub-Lieut. 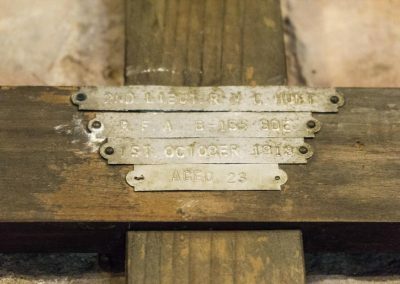 in the Royal Navy from which he was invalided in 1916. His health restored he offered himself for active service in the Royal Field Artillery in the victorious advance. 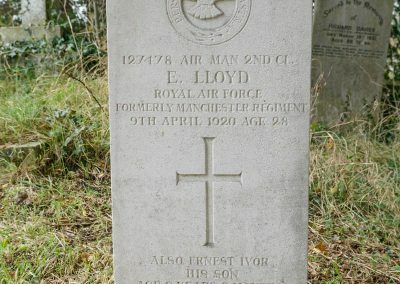 He fell at Epinoy mortally wounded and died on 1st October 1918. 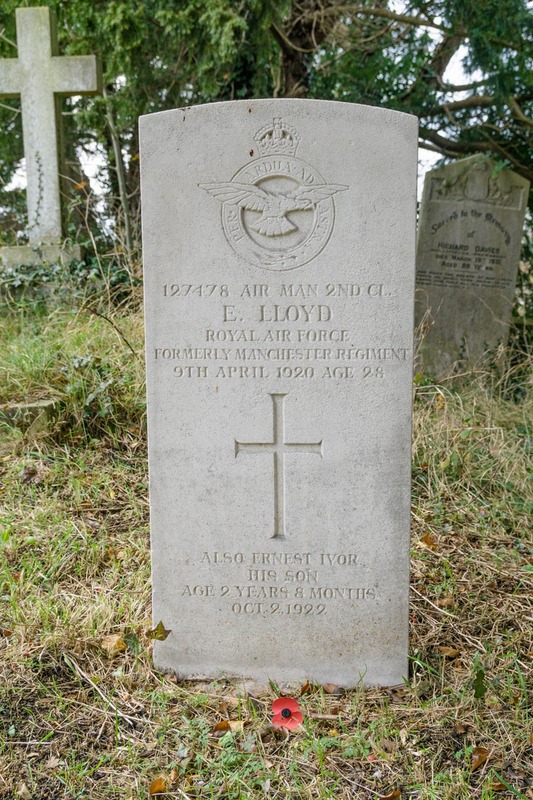 His grave is at Etaples facing the sea and England’. 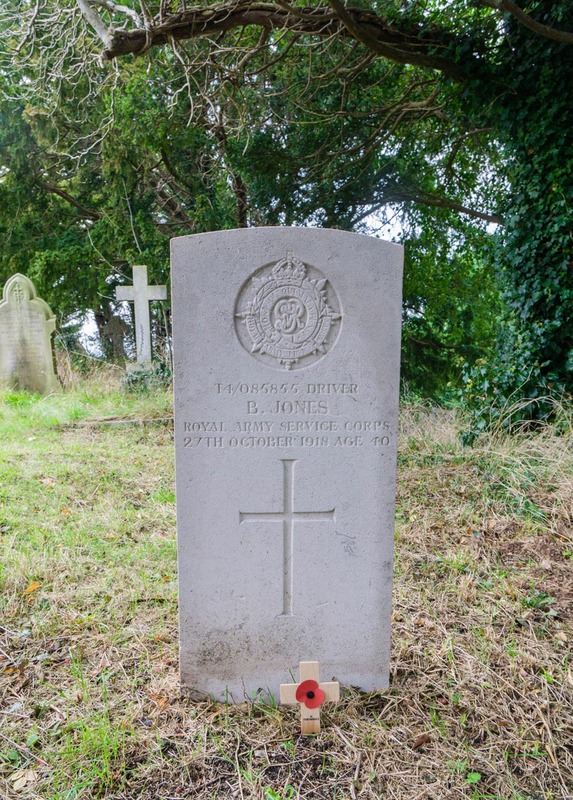 Roger Victor Cecil Hunt was 23 when he died from his wounds. 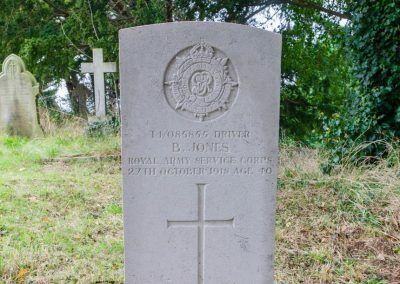 He is buried at Etaples Military Cemetery (grave ref XLVIII.A.3). 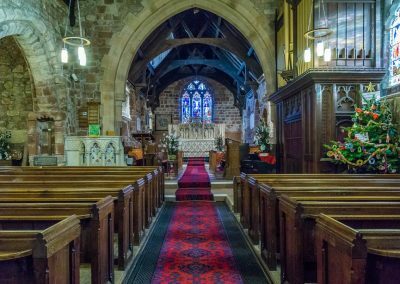 Ruyton-X1-Towns has an interesting history. 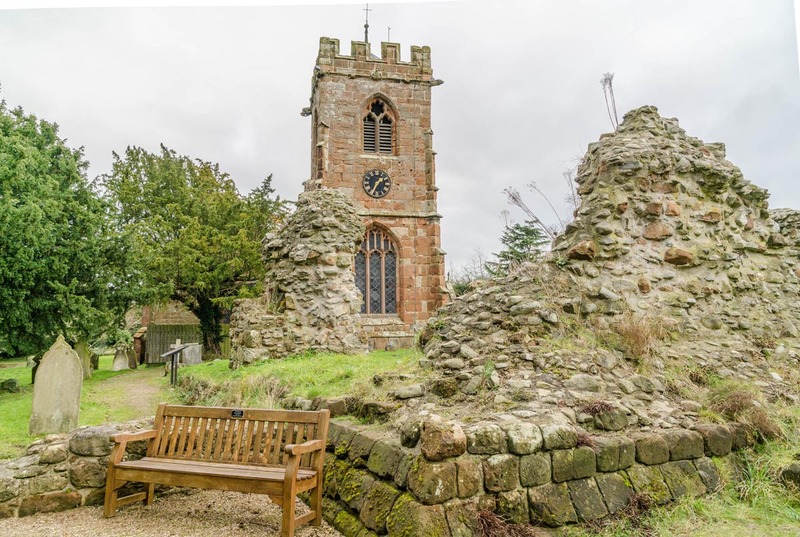 The village acquired it’s unusual name when the 12th century castle was built near the church and it became the major manor of eleven local townships. 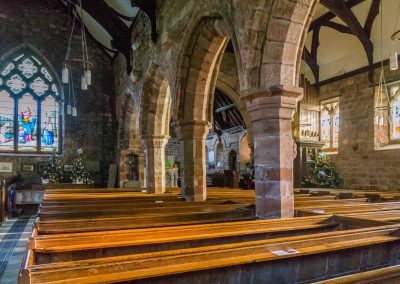 St John the Baptist Church is a grade 1 listed building set on a hill with beautiful grounds which include the ruins of the castle. 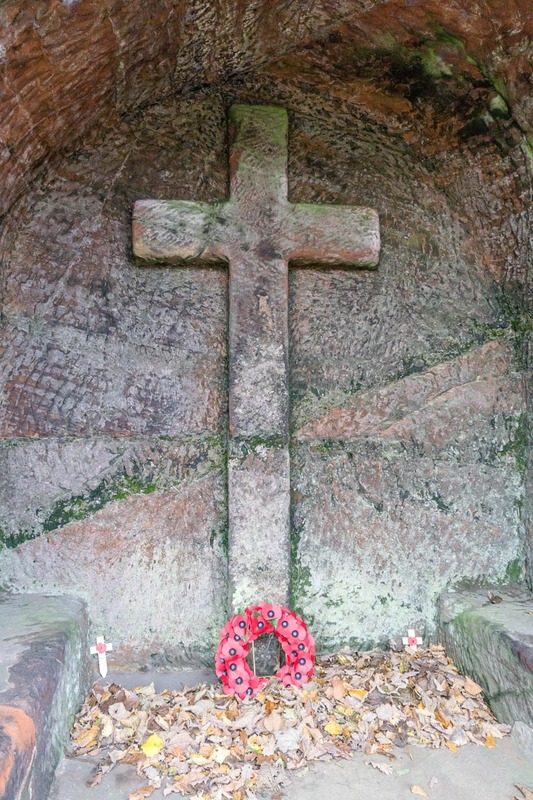 There are also some Commonwealth war graves in the churchyard. 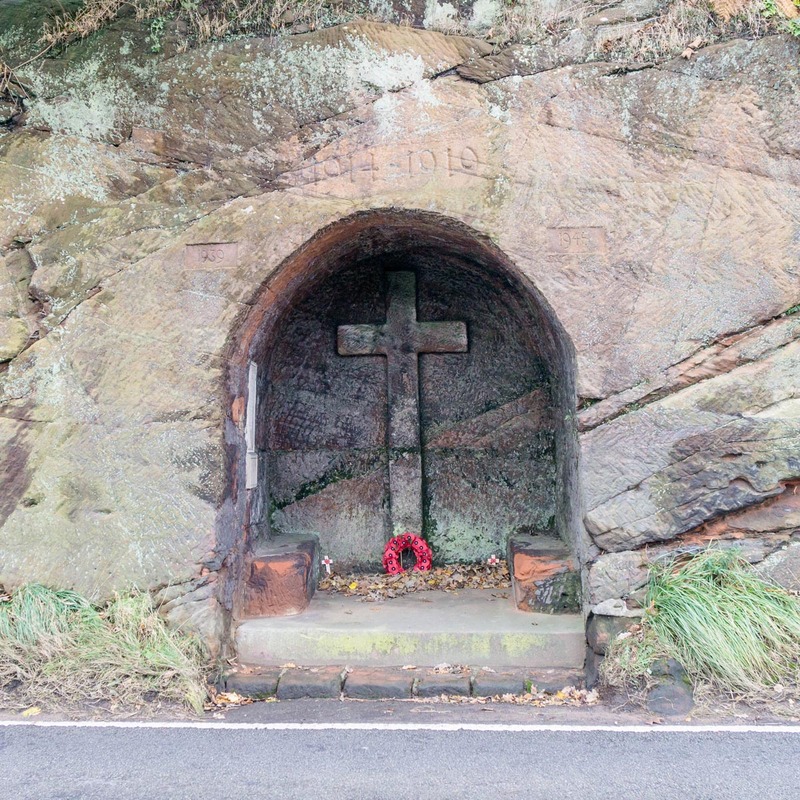 The parish war memorial is also very unique in being in the form of a cave which has been carved eight feet into the sandstone cliff on the road leading out of the village. 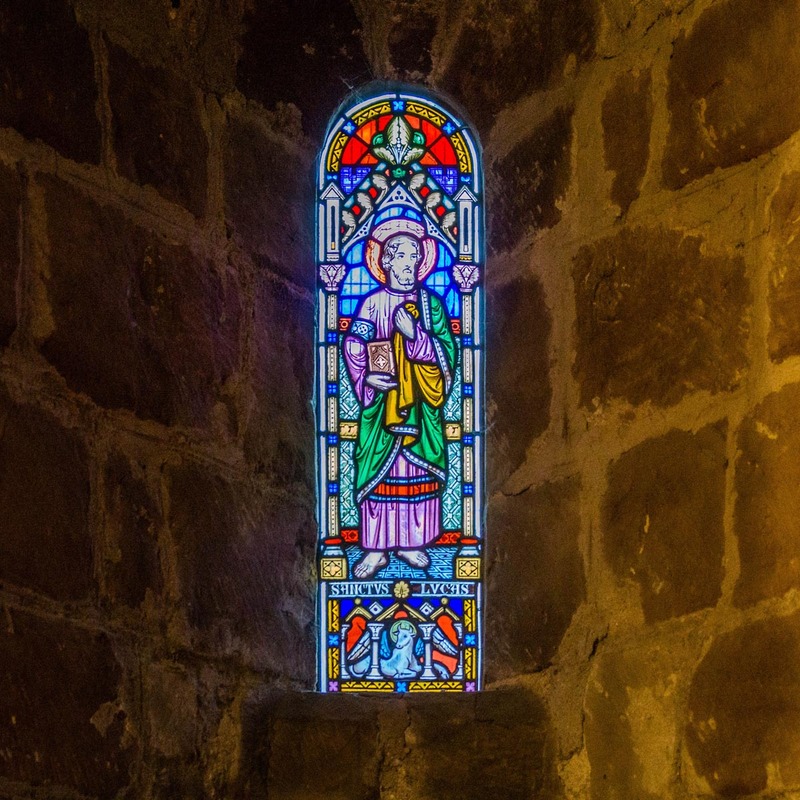 It was sculpted by Warwick & Len Edwards (Father & Son) and unveiled in October 1920. 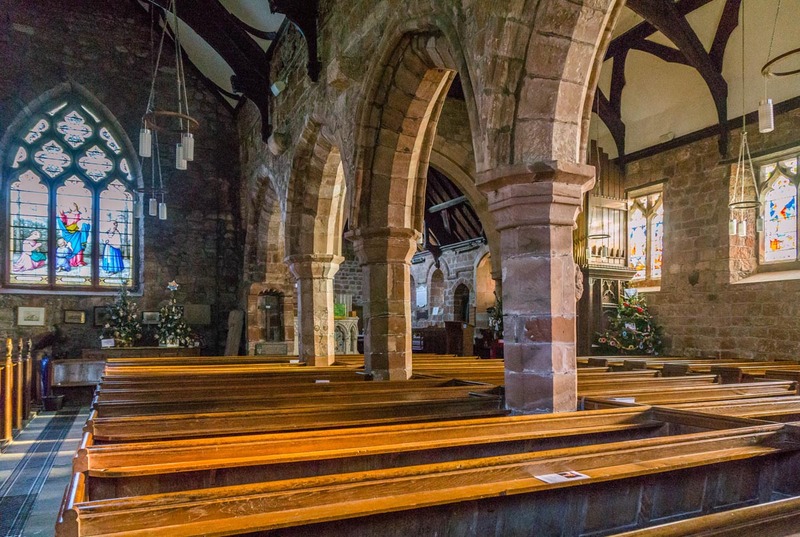 It contains a large stone cross, two seats and three plaques. 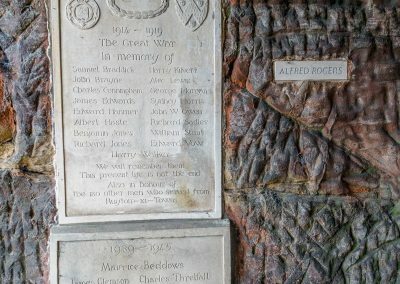 Two plaques contain the names of those known to have died in both World Wars, while the third is dedicated to Alfred Rogers whose name had been missed off the original plaques. This was added in 2007. 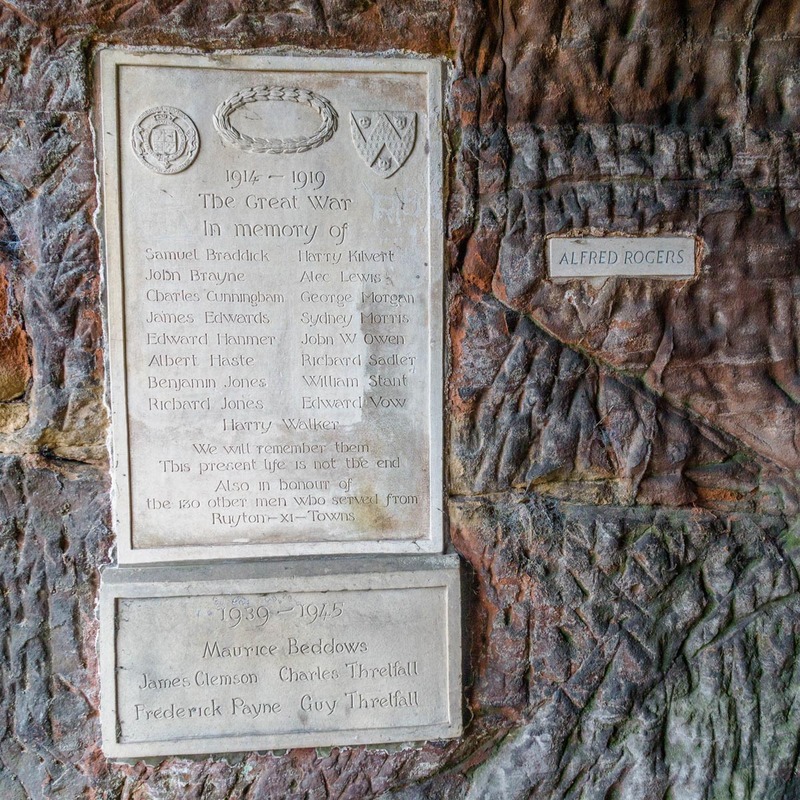 Above the cave is carved ‘1914-1919’. 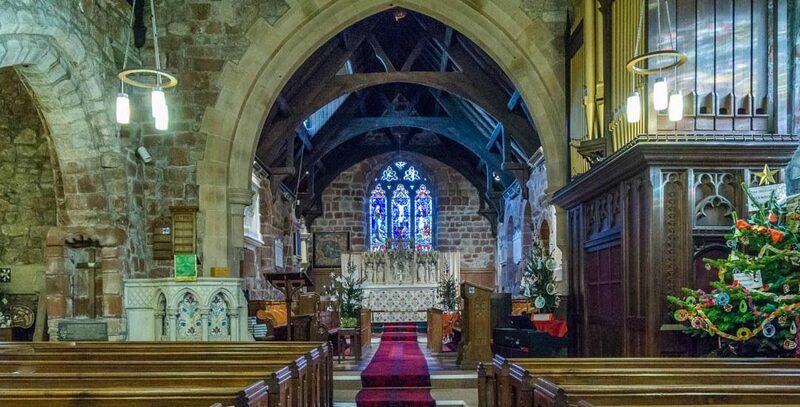 A young Arthur Conan Doyle (the creator of Sherlock Holmes) also lived in Ruyton for four months while working as an unpaid medical student in 1878. He worked for a Dr Elliot and lived at Cliffe House. 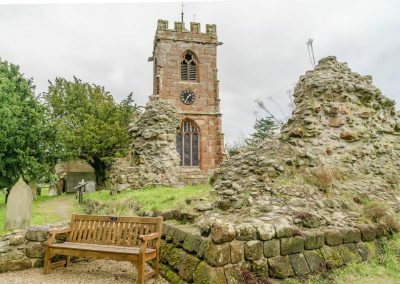 He later described Ruyton in his ‘Memories & Collections’ in 1923 as ‘not big enough to make one town, far less eleven!’ It is thought that he gained inspiration for some of the characters in his later stories while living and working in Ruyton.